Wondering what everyones favorite spoons are during the hardwater season.<BR>Here are some of mine. These are my most used spoons. What are your favorite spoons, jig, tip up set ups etc? forage minnow spoon fo shizzle. It will be nice to see what everybody else uses but these are my 3 go to spoons. ivegottabite. What size Castmasters do you usually use? What are your hot colors? In no particular order --glow Angel Eyes, with the hooks changed to Mustad Triple Grip and larger split rings-- small size Crushers, especially the ones with the new high tech finishes-- gold Cicadas-- Buckshot Rattle Spoons, sometimes with the treble removed and a 3 to 6 inch dropper with a single hook, great Perch rig. 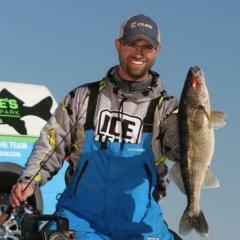 I have a great investment in ice fishing lures but these are the go-to lures. A lot of the rest are just for show. i don't know the ounces off hand but the length is 1" to 1 1/4". firetiger has always been a great color and the silver w/ blue stripe works well for the eyes also. i also use the perch, gold, and silver w/ chartruese. back home in south dakota that's all my buddies ever used, so i used them also. seems like you could use a kastmaster or buckshot to call in the eyes and some days you couldn't get it down fast enough! for the pike guys--could always get some pike with them too. I prefer the Flasher Spoon or Crusher Spoon by JR's Tackle. 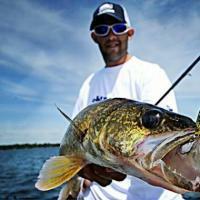 Both are fished in a different manner and have different action but are very productive for walleyes and pike. Rattle spoons are also high in my book. Kastmaster style spoons work well too. A lot of people have good success with Angel Eyes as well. I've done pretty good in the past with smaller spoons for panfish and perch, like say a 1/16oz spoon. Glow red has been a hot item the last couple years and should be no different this year. are you taking spoons for eyes or other fish? Doesnt matter what type of fish I guess because a lot of these spoons arent used for only walleye. Most of these I can downsize for Perch or Crappie. Im a fairly agressive Fisherman so Spoons are my favorite. Raps, Chubby Darters and Jigging plastics would have to be second. Spoons...what a topic. Not an ice fishing trip goes by that I do not have at least on one rod rigged with a spoon. I almost always fish with a spoon tied on one rod and a dead stick in the other holes Many times the spoons action will attract the fish and it will hit the spoon but many other times it will take the dead stick. My favorites would include the Angel Eye [email protected] to duplicate that dying minnow, The Go DevilTM, to duplicate a feeding bait fish, or the JB lure Rattlin Varmit Spoon to call them in with their loud built in rattle. Size, shape and color depend mostly on the water conditions and fish preferences that day. My number one color for the Angel Eye [email protected] is the Glow/Pink. For the Go DevilTM it is the 1/8th oz or the 1/16th oz Glow Perch. When Crappie fishing I will sometime switch to the Neon Red Glow. Most of the time I will tip these spoons with just the head of a minnow. I don't know that I have favorites,but the fish I have polled seem to like these. JR's Crushers and Flutter Crushers,along with JR's Minnows when the fish are prefering a slow or stationary horizontal bait. And some cheapo Walmart spoons.Can't remeber what they are called but they come in a 5 pack and are designed for open water casting.You HAVE to replace the hooks on them. I also make sure I have some airplane jigs,Rapala's,Chubby's and Nils for aggressive horizontal presentations. Do you guys usually tip your spoons with anything. I usually tip them with a head or at times tails. When fishing Lake Superior and at times LOW I will use a whole shine or both a head and tail on seperate hooks. I let the fish tell me what they want. When using the Angel Eye Spoons I will tip that with just the head of a minnow when after walleye and perch but often times I will use a whole minnow for the slab Crappies. When using the Go Devils I normally just use either a minnow head, wax worm or the finesse plastics from Custom Jigs and Spins. Notice a patter of what I like?? All of these are great lures for me. I probably use these 90% of my time fishing and the other 10% I use chubby darters, or jigging rapalas, or plain lead heads. These are all good ones for me. I always fish them with 2 minneow heads never a whole minneow it give the fish to much to play with and I have lost to many fish with the minneow tearing off. I have also found that it make a difference 1 head or 2. If I have one head on I have had lots on fish on the Marcum that won't bite. I reel up put the second head on drop it back down and wham fish on. My favorite colors are GOLD, a GOLD, a GOLD, Glow red, pink/white, perch, Glow. The gold it the big part especially on lake of the woods. I always say it doesn't matter what you use up there as long as it has gold on it. I always carry about 3 plano trays of jigging spoons when I hit the ice. There are just a ton of great jigging spoons out there today. Yes the Jerk would be another great choice as would the Phelps Glow Spoons or the many spoons offered by Custom Jigs & Spins. Gapen's "The Jerk" 1.5 to 2"
Ahh yes, jigging spoons, my favorite topic by far. I could talk jigging spoons all day. I use them for everything, literally. I'll incorperate a dropper for 'gills even. By far my favorite spoons would have to be Phelp's Glow Spoons. I've had so much success on the glow spoons that I haven't used anything else in a couple years. Of course I have a large selection for my clients, but they always end the day with a blue/glow Phelps spoon. Blue/glow 1/4 oz. is my weapon of choice for 'eyes, and the 1/8 oz. slim size is great for crappies on Red and also to use a dropper with for perch. They also came out with a new complete glow red spoon that will be available at Gander Mt.s this winter, it looks like a killer! I grew up on Swedish Pimples and worked my way through a variety of spoons throughout the years, these would be my favorites in order. All of the above are tipped with a minnow head or euros.